Earnings Season Has Started: Which Earnings Reports Should You Watch? Earnings season comes around four times per year, and falls in the months of January, April, July and October. For the most part, the season is over about a month and a half after it starts. The meat of the reports are typically clustered together in about a 3 week period, with more unknown companies reporting at the beginning and end of the season. 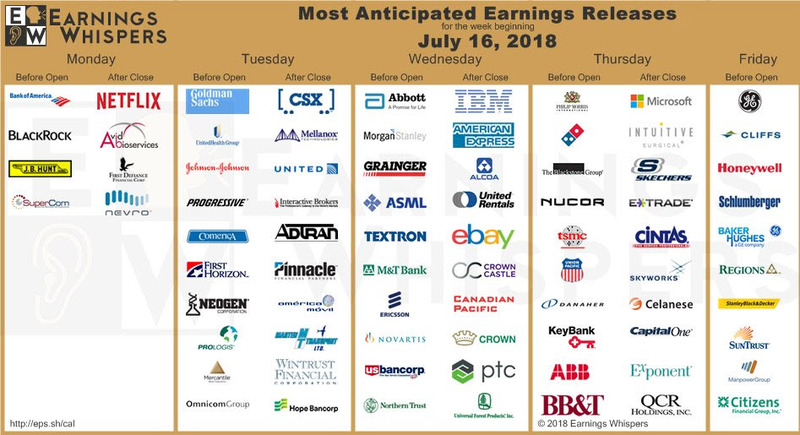 The main meat of the earnings period generally starts in the middle of the month, with the bank stocks kicking it off as the first major players to report their earnings for the quarter. Tech follows shortly thereafter. At Simpler, we are primarily focused on playing both tech companies and other big name stocks, as well as whatever stocks fall within the current strongest S&P sectors. The season typically lasts about a month and a half, depending on which industries and companies you’re interested in. We like to focus on big name stocks, as they offer the best volatility and price movement that enable us to capitalize on our ideas in the options market. How Do We Trade Earnings? We typically will play a company one of three ways. We will either look for a price rise going into earnings, we will trade the actual earnings report, or we will place an after-earnings trade. These are three separate ideas, based on three different pieces of analysis. Let’s look at a couple examples below. Starting this week, I’ll also begin to look for additional longs to add on companies reporting earnings within the next 2-3 weeks. A favorite here is TTWO, Take Two Interactive Software. This company has shown a clear pattern of trading higher into earnings for the past five years. This one in particular was pointed out by our friends over at www.CMLviz.com, who help us time entries on these trades with their TradeMachine Pro scanner. What about additional ideas? I also like Alibaba Group (BABA), Autodesk, Inc (ADSK), IDEXX Laboratories, Inc (IDXX) and Salesforce.com (CRM). The key with these trades isn’t just to buy them before earnings, it’s to use technical analysis to identify pullbacks with an edge (preferably Fibonacci) to get a nice entry point. After the ‘Run into Earnings,’ we start playing the actual earnings reports. What is on the docket for this week? I always look to Earnings Whispers to check out the calendar. The image below gives us a nice idea of what is coming up. I like to check the calendar at least 2-3 weeks ahead of time, to plan out my earnings runs. JPMorgan Chase & Co. (JPM), Citigroup (C) and Wells Fargo (WFC) kicked off the meat of earnings season on Friday, July 13th, with the big banks always starting the round. All eyes are on the banks here, as the financial sector has given up the bullish trend of 2017 in early February and hasn’t been able to recover. Last quarter, the sentiment surrounding the banks was that a strong earnings season could help recover the trend. Well, that did not work, and the Financial Select Sector SPDR Fund (XLF), along with the key bank stocks have continued in a bearish trend, repeatedly failing at resistance levels each time they try to recovered. So, where do we go from here? Well, there is still a long road ahead for the bank stocks to recover. JPM, #2 weighted product within XLF, beat earnings and yes – had a delayed positive reaction Monday morning, up 4% at one point. It did blow through the resistance at the 50 and 200 simple, and it’s getting closer to reversing this downtrend into an uptrend. C and WFC didn’t fare so well initially, though they did get a late bounce. While they have rallied slightly off of these reports, I still see both of them trading lower in the near-term as well as the long term. Strong earnings for C and JPM wasn’t enough to reverse this bearish trend, but it did give them a kick to the upside. At this point, if this rally fails without completely reversing the trend, I’m not sure what it would take to correct this bearish trend. What about the markets? The markets quiet reaction to these reports tells me that the overall market isn’t very concerned about them, either. That being said, if the S&Ps are going to continue higher, which, I think they will, the banks are going to need to participate instead of weigh down the index. Right now, the strength in XLY, the Consumer Discretionary SPDR ETF, and XLK, the Technology Select Sector SPDR Fund, has pulled the S&Ps past 2800 for the first time since March 13th, 2018. As of right now, the S&Ps are lagging behind the Nasdaq and Russell, which have both made new highs much more recently than the S&Ps. I do favor the S&Ps for new all-time highs of 3000 by the end of the year, but, when will we get that? Or more importantly, in the near-term, when will we finally break above the major resistance level of 2808? Of course, it’s earnings season and I think this is the prime time to give the index the boost it needs to resume a bullish trend for good. We have already seen the ‘Run into Earnings’ strength with the Nasdaq. The NQ made an all-time high on the year again on July 17th, 2018, off of the backs of Microsoft, Google, Facebook, Paypal. Is this run up in price that occurred right before all of these companies report earnings a coincidence? I think not. Check out the Amazon daily chart below. Here at Simpler, we play this move every quarter with short term, aggressive options. Buying options in these names is a great way to capitalize on folks who buy the stock right before the earnings date, pushing up the price, in hopes of a solid earnings report. Since we know that is a typical pattern, we like to capitalize on the ‘run into earnings’ and take advantage with short term options, going into the earnings report. We have already seen solid runs in AMZN, MSFT, GOOGL, FB and PYPL. What’s next? For now, I’m guessing the Nasdaq will take a breather after this incredibly strong week. Hopefully, that breather will give us another pullback to the mean and buying opportunity. Discover exactly what a Honey Badger Stock is here. What about some atypical plays? These are our honey badgers. They are the stocks that don’t care what the overall market is doing. They are the stocks that don’t fall when the market falls, and they trade higher than what the market is, on most days. The stand out, and their strength is some of the best – especially for a directional trader. Well, I’ve noticed a subset of setups within the bargain retailers. I particularly like Burlington Stores Inc (BURL) and TJX Companies (TJX). They have incredibly strong technical charts, and coupled with the consolidation on the daily charts, tells me they are ready to breakout to new highs. I want to be along for the ride, so I’m stalking entries there. Additionally, I like Lululemon Athletica (LULU) for a long play with the daily and 195-minute squeezes. They’ve held up well on down days in the market, telling me they can be considered honey badgers. What are you stalking this week? What are your favorite Run into Earnings to play? Drop a comment below. Want to check out any of these earnings trades? Join our chatroom (if you’re not already a member!). Learn more about the Run into Earnings here on our Earnings blog post from Q1.